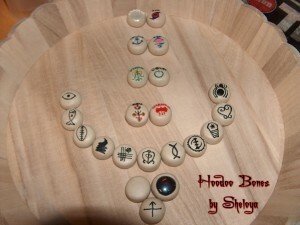 I’ve finally finished my first “runes” project, a set of African diaspora themed Hoodoo “bones”. We’re doing a promotional auction on eBay, and selling them in our eCrater store as well. You can also buy them here. These are made from polymer clay and glass, and the designs are embedded, not painted on. So they won’t rub off from reasonable use. Click here to learn how to use your Hoodoo Bones. I’m also designing a wooden set made on short, flat sticks with rounded ends. The prototypes will hopefully be ready at the beginning to middle of next week. bones, fortune telling, hoodoo, readings, runes, vodun, voodoo. Bookmark.